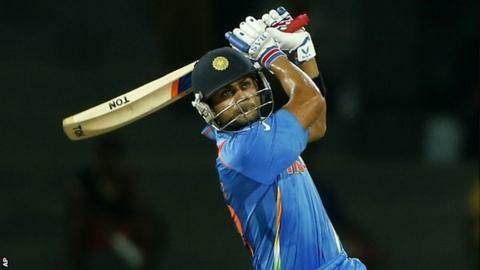 India had to draw on all their experience to overcome a spirited Afghanistan side by 23 runs in their opening match at the World Twenty20. When Afghanistan were 75-2 after 11 overs, chasing 160 to win, a famous upset looked on the cards in Colombo. But Yuvraj Singh took two wickets in two balls and, although Afghanistan still had hope into the latter stages, they were eventually dismissed for 136. India survived four dropped catches to post 159-5, with Virat Kohli making 50. "I will be looking forward to Friday's game between England and Afghanistan a lot more than the England players I would imagine. There's a lot to be wary off and a lot to admire in this Afghanistan side. Mangal is a class player and and Sidiq impressed me." Afghanistan, who face England on Friday, are appearing in only their second global tournament, but on this evidence they have the raw talent and determination to become a fixture in the biggest events. If they have a flaw, it is their fielding, and were it not for the spilling of four routine catches, India could easily have been pegged back to a total that was well within reach. Put into bat at the R Premadasa Stadium, India lost both openers cheaply in an exhilarating opening burst from the tall left-arm paceman Shapoor Zadran as Gautam Gambhir was bowled off an inside edge and Virender Sehwag was caught behind off a ball angled across him. Yuvraj, returning to the side after almost a year undergoing treatment for a rare form of lung cancer, was the first to benefit from some generous fielding as Mohammad Nabi put down a sharp chance off his own bowling. He went on to crack 18 off 20 balls before he sliced a cut to short third man. With India three down and still not flowing with the bat, Afghanistan sensed their chance, only to be badly let down by some elementary errors as three more catches were put down in the space of four overs. Nabi spilled a caught and bowled chance above his head, Karim Sadiq suffered the ignominy of dropping a Kohli drive over the rope for six, and Sami Shenwari grassed the easiest of the lot after Raina had spooned to point. When Dawlat Zadran finally clung on to a catch to remove man-of-the-match Kohli, he and Raina had added 56 runs for the fourth wicket and India were on the charge. Raina advanced to 38 off 33 before he was bowled by Nabi in the final over, his dismissal merely clearing the stage for captain Mahendra Dhoni to belt 10 runs off the last two balls of the innings. Afghan wicketkeeper-batsman Mohammad Shahzad made a startling recovery after coming off injured midway through the India innings after being struck on the knee by the ball. Coming out to open the bat, he lived up to his billing as an entertainer and found the boundary with his trademark "helicopter shot" - a wristy whip through the leg side with very little backlift and a check finish. Sadly, the fireworks were short-lived as a mistimed pull off Lakshmipathy Balaji was caught by Yuvraj, who then trapped the dangerous Nawroz Mangal lbw for 22 with his first delivery. Sadiq and Ashgar Stanikzai kept Afghanistan in the hunt, but with the run rate creeping up beyond nine Sadiq took one risk too many. A big heave into the leg side was caught by Gambhir at deep midwicket, and Yuvraj struck again with the very next ball to have Ashgar Stanikzai caught behind. When Ravichandran Ashwin removed Samiullah Shenwari for one, India looked certain to wrap up a comprehensive win, but a blistering 31 off 17 balls from Nabi revived hopes of a shock. He blasted two sixes and two fours but came unstuck when he was induced into a false shot by a cleverly delayed delivery from Ashwin and was pouched at mid-off. With Nabi back in the hutch, Afghanistan's last chance had effectively gone and India swiftly wrapped up the tail to put themselves on the brink of the Super Eights.